It had been only a year since the death of Jochen Rindt at Monza but the face of Formula 1 had changed a lot. There were still some legal problems between the team and the Italian authorities which resulted from the accident and so Team Lotus did not officially enter the event, although a black and gold Lotus-Pratt & Whitney 56 did turn up under the name World Wide Racing. McLaren was also down to just one entry as Denny Hulme was was away in the United States for a USAC race in California. Matra was also running only one car as Jean-Pierre Beltoise was still suspended as a result of the sportscar accident in January in Buenos Aires which had cost the life of Ignazio Giunti. The field was bolstered by a third Surtees, entered for Mike Hailwood, who was back in F1 after six years away. The team was in confident mood as John Surtees had won the non-championship Gold Cup at Oulton Park a few days earlier. On the fast sweeps of Monza the V12 cars were very competitive and so Chris Amon was on pole in his Matra with Jacky Ickx alongside in his Ferrari. The second row featured the BRMs of Jo Siffert and Howden Ganley and the first V8 car was the Tyrrell of Francois Cevert, who was fifth on the grid, slightly faster than Ronnie Peterson's March, Jackie Stewart's Tyrrell and Clay Regazzoni's Ferrari. The top 10 was completed by Tim Schenken's Brabham and Henri Pescarolo in Frank Williams's March. At the start of the race Regazzoni made a remarkable start from the fourth row to take the lead and the action behind him was intense as a group of cars slipstreamed around the autodromo, the lead passing backwards and forwards between them. After Regazzoni was toppled, Peterson took the lead and then to Stewart before Regazzoni was back again. Also involved in the fight were Cevert, Siffert, Ickx, Ganley and Gethin. On lap 16 both Stewart and Ickx disappeared with engine failures and two laps later Regazzoni went out as well. While this was happening Hailwood and Amon joined the leading group. Dropping away from the fight were Siffert and Ganley who were both suffering from overheating engines. Siffert did rejoin the leaders a few laps later but then his gearbox began to play up and he dropped back again. For a brief period Amon took the lead and looked like being able to break away but then he lost his visor and dropped back. His engine also began to overheat and so he dropped away from the leading group. The five-car battle for the lead lasted all the way to the finishing line with Gethin getting there by 0.010 secs. The first five cars were all covered by 0.61s. It was the closest finish in the history of the World Championship and the fastest ever race, with an average speed of 150.75mph. 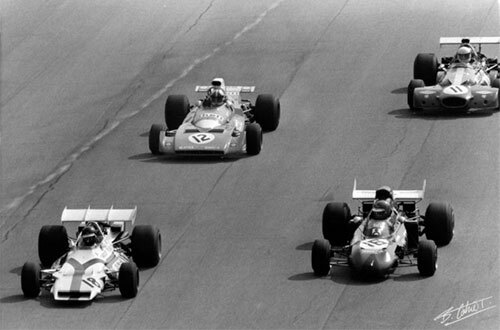 Peterson was second with Cevert third, Hailwood fourth and Ganley fifth. Amon was sixth over half a minute behind.